A lot of cool-looking but pretty much worthless items have been brought into this world under the guise of design. So it's no wonder that this admittedly awesome but totally useless see-through TV has the word "designer" in it. Haier calls itself the #1 Brand in the World* (that's their asterisk, not ours). So why would it sully its internationally renowned name with a device that looks like you're viewing your favorite shows through a urine-stained piece of glass? The technology behind the TV is impressive. The TV itself? not so much. Some incredibly talented people clearly worked on the Designer Transparent Series Television. Let's hope next year, those same folks are put on something that's actually useful. 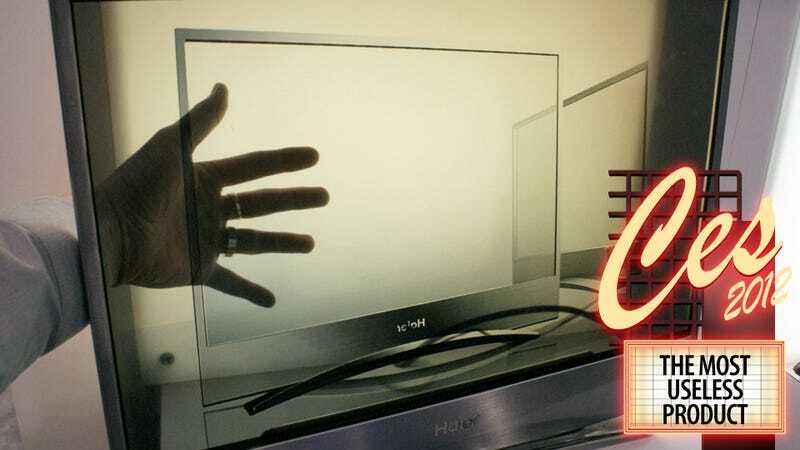 Transparent TV: Insanely Cool, But Also Why Is This a Thing?